Edition of 1920. See also Declaration of Independence on Wikipedia, and the disclaimer. DECLARATION OF INDEPENDENCE, United States. The steps by which the extra-legal de facto governments of the colonies during the early Revolution — the Committees of Correspondence and Safety — were turned into formal legislative bodies, are detailed under Constitutions, State; and Congress, Continental. The first Congress, of 1774, assumed neither executive nor legislative authority. The second, early in its existence (6 July 1775), formally disclaimed any purpose of separation. The first half-unconscious step was the appointment, November 1775, of five commissioners to maintain communications with friends of the colonies in “Great Britain, Ireland, or elsewhere”: only independent countries send ministers. Thomas Paine's ‘Common Sense,’ urging independence as inevitable, and the sooner the better, appeared 9 Jan. 1776; it had wide influence and unlocked many tongues. So general was the concurrence with Paine's views that, in fear of them, three of the middle colonies — New Jersey, Pennsylvania and Maryland — instructed their delegates to vote against any such measure; the other two, New York and Delaware, were bitterly divided and their delegates took no part in forwarding the independent movement; South Carolina was also hostile, contrary to its usual habit of eager initiative — probably from fear of England stirring up the great Indian confederations against the South, as was afterward done. But events pushed them on. British naval captures led Congress, 23 March, to declare all British vessels lawful prize; and on 6 April it opened all United States ports to all vessels other than British. This was an act of absolute sovereignty, acknowledged or not. The colonies, under instructions from Congress, were steadily forming State governments (see Constitutions, State); and Congress 10 and 15 May recommended all the remaining ones to take the same step, which of course involved making their common Union independent also. John Adams was the foremost agent in all this work. The North Carolina convention 22 April resolved to “concur with those in the other colonies in declaring independence.” On 17 May Virginia instructed her delegates in Congress to move a “Declaration of Independence”; and on 7 June Richard Henry Lee made a motion to that effect in Congress, which was seconded by John Adams. On the 8th and 10th this was debated in Committee of the Whole; but action was postponed to 1 July, as some delegations were averse and others were waiting instructions. 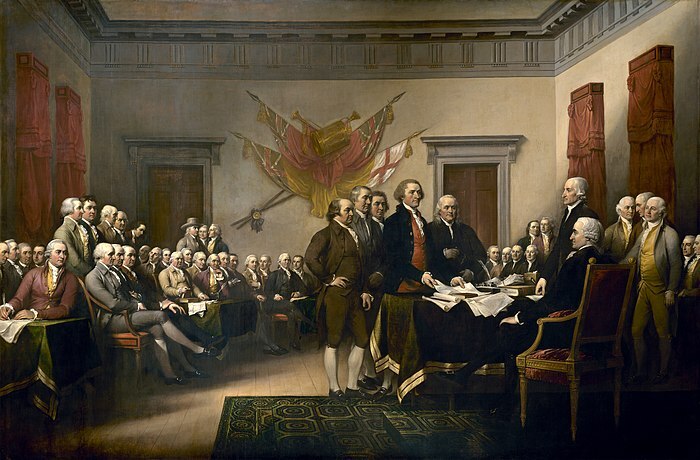 On the 10th a committee of five was appointed to draw up the Declaration: Thomas Jefferson of Virginia, John Adams of Massachusetts, Benjamin Franklin of Pennsylvania, Roger Sherman of Connecticut and Robert R. Livingston of New York. Its composition was assigned to Jefferson by the committee; the latter and Congress made many changes, but mostly by omission rather than alteration of wording, so that the language is practically all Jefferson's. The chief cancellations were five; (1) and (2) The last two counts of his indictment of the king. (1) That he had “incited treasonable insurrections of our fellow-citizens” by promising them confiscated property. The charge was probably felt to be too weak to maintain, as well as likely to weaken the general case. (2) That he had carried on the slave-trade, and refused to allow American legislatures to suppress it. South Carolina and Georgia, which were actively carrying it on themselves, would not permit this; and too much Northern wealth had been earned by it not to make the North very willing to suppress the passage, which would impress foreign nations unpleasantly as to their sincerity. (3) Superfluous rhetoric about the incredulity of “future ages” as to the daring tyranny of the king. (4) Review of American history, denying that Great Britain had assisted in our establishment, and alleging that “submission to their parliament was no part of our constitution.” It was thought best to go as little into the remote origins as possible, fixing the attention upon recent oppressions and natural rights; and above all, to ignore the existence of Parliament altogether. That body is not alluded to, except inferentially as the “others” with whom the king has “combined” to subject the colonies to an alien and illegal jurisdiction. This was in pursuance of the steady contention of the colonies. (5) Attacks on the English people for re-electing “the disturbers of our harmony,” and allowing their chief magistrate to perpetrate these enormities. This was struck out to avoid giving offense to the friends of the colonies in England, who in fact, by upholding Liberal leaders and even generals, saved us at last. The Declaration was reported 28 June. On 1 July as fixed, debate was begun afresh on Lee's resolution. New Jersey and Maryland had reversed their instructions meantime. In Committee of the Whole that evening, nine States voted for it; Pennsylvania and South Carolina voted against it (but the latter delegates, possibly after hearing from the South, offered without instructions to vote yes if it would make a unanimous vote), Delaware was divided, and New York refused to vote. The "yea" Delaware delegate, McKean, sent an urgent message to the third, Cæsar Rodney, then on a political trip in southern Delaware, to come on at once; Rodney traveled 80 miles the next day, arrived in the evening, and reversed his State's vote. Pennsylvania reversed hers also; and this leaving only the abstaining New York delegates out of the voting, the South Carolina members voted yes. This carried the motion that “these united colonies are and of right ought to be free and independent States, that they are absolved from all allegiance to the British Crown, and that all political connection between them and the state of Great Britain is and ought to be totally dissolved,” by 12 yeas and no negative vote. On the 3d the Declaration was taken up, and as amended was passed on the evening of the 4th. The anniversary of the fact of independence is therefore the 2d; that of the adoption of the specific document in which it was proclaimed to the world is the 4th, as celebrated. The usual statement that it was “signed” by the members at this time, however, is incorrect; it was signed by the president and secretary, whose signatures only were borne by the printed copies sent out. The journals of Congress did not enter the Declaration, but left a blank for it, which was afterward filled in and the signatures taken from the engrossed copy. On the 9th the New York convention ratified it, and the delegates gave in their formal adherence on the 15th; it was then, as entitled, “The Unanimous Declaration of the Thirteen United States of America.” Six additional Pennsylvania members also recorded a formal vote on the 20th. On 19 July Congress passed a resolution that it should be engrossed on parchment, and on 2 August it was signed by 53 members present; Gerry of Massachusetts, McKean of Delaware and Thornton of New Hampshire were empowered by their legislatures to sign later, Thornton not signing till 4 November. For an analysis of the Declaration and bibliography see United States — The Declaration of Independence. The parchment with the original signatures was deposited with the Department of State when the government was organized in 1789. In 1823 John Quincy Adams had a copper-plate facsimile made, to give copies to the signers and their heirs; but unfortunately it ruined the original. The wet sheet pressed on its face drew out the ink so that the signatures have become illegible and almost invisible, and the text partially so; and after being shown for many years only on special occasions, in 1894 it was definitely sealed up in a steel case to keep it from light and air. From 1841 to 1877 it was in the Patent Office. Massachusetts: John Hancock, Samuel Adams, Robert Treat Paine, Elbridge Gerry. New York: William Floyd, Philip Livingston, Francis Lewis, Lewis Morris. Pennsylvania: Robert Morris, Benjamin Rush, Benjamin Franklin, John Morton, George Clymer, James Smith, George Taylor, James Wilson, George Ross. Delaware: Cæsar Rodney, George Reed, Thomas McKean. Virginia: George Wythe, Richard Henry Lee, Thomas Jefferson, Benjamin Harrison, Thomas Nelson, Jun., Francis Lightfoot Lee, Carter Braxton. South Carolina: Edward Rutledge, Thomas Heyward, Jun., Thomas Lynch, Jun., Arthur Middleton. It may be noted that several of these were not members of Congress when the Declaration was passed. He has refused, for a long time after such dissolutions, to cause others to be elected; whereby the legislative powers, incapable of annihilation, have returned to the people at large for their exercise; the State remaining, in the meantime, exposed to all the danger of invasion from without, and convulsions within. He has endeavored to prevent the population of these States; for that purpose, obstructing the laws for the naturalization of foreigners; refusing to pass others to encourage their migration hither, and raising the conditions of new appropriations of lands. Nor have we been wanting in attention to our British brethren. We have warned them, from time to time, of attempts made by their legislature to extend an unwarrantable jurisdiction over us. We have reminded them of the circumstances of our emigration and settlement here. We have appealed to their native justice and magnanimity, and we have conjured them, by the ties of our common kindred, to disavow these usurpations, which would inevitably interrupt our connections and correspondence. They, too, have been deaf to the voice of justice and consanguinity. We must, therefore, acquiesce in the necessity which denounces our separation, and hold them, as we hold the rest of mankind, enemies in war — in peace, friends. We, therefore, the Representatives of the United States of America, in General Congress assembled, appealing to the Supreme Judge of the world for the rectitude of our intentions, do, in the name and by the authority of the good people of these Colonies, solemnly publish and declare, That these United Colonies are, and of right ought to be, Free and Independent States; that they are absolved from all allegiance to the British crown, and that all political connection between them and the State of Great Britain is, and ought to be, totally dissolved; and that, as free and independent States, they have full power to levy war, conclude peace, contract alliances, establish commerce, and to do all other acts and things which independent States may of right do. And for the support of this declaration, with a firm reliance on the protection of Divine Providence, we mutually pledge to each other, our lives, our fortunes, and our sacred honor.